thanks for this article. It provides me, a yachtman in Central-Europe a revelation. I’ve participated unfortunately at none of these regattas, still the majority of them is regarded by me too as of main events of our nice sport. The rest serve to my better understanding on the scene. With my head I’d consider Kieler Woche and Hyeres Regatta as events of top significance within Europe with serious international attendance (In 1978, once in my life I could attend and participate Kieler Woche in 470). Our younger sailing colleagues refer to the Centomiglia Regatta as an other important event that could perhaps be a subject of such a ranking consideration. On the other hand it would be interesting to have some more insights about candidate events organized in other continents like Asia and America too. Maybe it reveals my personal bottlenecks :), in spite of my committed internet browsing I have had almost no information about them. 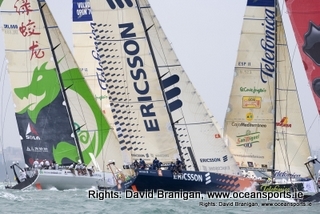 I made a translation into hungarian for the sake of our sailing community: you can find it at http://www.vvsz.sport.hu/node/254. I hope and ask your kind support to this publication. Hi I’m writing a thesis on the Rolex Middle Sea Yacht Race, part of the Rolex yachting series. I’m wondering where you would place it and if you have any interesting information for me. Thx for your comment! The Rolex Middle Sea Yacht Race is certainly a prestigious one and starting in a couple of weeks. As far as I know more than 60 boats will participate of which some of the big yachts like Ran and Esimit Europa. You can find more info on their site….I do not think it should rank in the top 10 but it is an interesting race; however there are more interesting ones taking place in the Mediterannee I believe. Nice paintings by the way! Where would you place Jules Verne trophy? I intend to write an article on it.